Definition at line 65 of file llviewerimagelist.h. Definition at line 182 of file llviewerimagelist.h. Definition at line 181 of file llviewerimagelist.h. Definition at line 162 of file llviewerimagelist.h. Definition at line 178 of file llviewerimagelist.h. Definition at line 173 of file llviewerimagelist.h. Definition at line 87 of file llviewerimagelist.cpp. Definition at line 363 of file llviewerimagelist.cpp. Definition at line 630 of file llviewerimagelist.cpp. References addImageToList(), LLViewerImage::getID(), hasImage(), llendl, llerrs, llwarning, mUUIDMap, and sNumImages. Referenced by LLSurface::createSTexture(), LLSurface::createWaterTexture(), getImageFromUUID(), LLViewerImage::initClass(), and LLFloaterReporter::takeScreenshot(). Definition at line 608 of file llviewerimagelist.cpp. References llassert, llendl, llerrs, llverify, mImageList, LLViewerImage::mInImageList, and TRUE. Referenced by addImage(), and updateImagesDecodePriorities(). Definition at line 1418 of file llviewerimagelist.cpp. References clamp_rescale(), LLMemoryInfo::getPhysicalMemoryClamped(), SIXTEEN_MEG, and U32_MAX. Definition at line 1157 of file llviewerimagelist.cpp. References f, LLControlGroup::getBOOL(), gSavedSettings, LL_IMAGE_REZ_LOSSLESS_CUTOFF, LLViewerImage::MAX_IMAGE_SIZE_DEFAULT, and TRUE. Referenced by createUploadFile(), and LLFloaterReporter::takeScreenshot(). Definition at line 1057 of file llviewerimagelist.cpp. References convertToUploadFile(), FALSE, IMG_CODEC_BMP, IMG_CODEC_JPEG, IMG_CODEC_PNG, IMG_CODEC_TGA, llendl, llinfos, and TRUE. Referenced by handle_compress_image(), and upload_new_resource(). Definition at line 993 of file llviewerimagelist.cpp. References f, FALSE, LLTimer::getElapsedTimeF32(), gImageDecodeThread, gNoRender, gTextureCache, gTextureFetch, llendl, llinfos, llmax(), mImageList, S32, TRUE, LLTextureFetch::update(), LLWorkerThread::update(), LLTextureCache::update(), and updateImagesCreateTextures(). Referenced by doPreloadImages(), and idle_startup(). Definition at line 651 of file llviewerimagelist.cpp. References LLViewerImage::getID(), LLViewerImage::hasCallbacks(), llverify, mCallbackList, mUUIDMap, removeImageFromList(), and sNumImages. Referenced by updateImagesDecodePriorities(), LLPanelLogin::~LLPanelLogin(), and LLSurface::~LLSurface(). Definition at line 447 of file llviewerimagelist.cpp. Definition at line 702 of file llviewerimagelist.cpp. Definition at line 328 of file llviewerimagelist.cpp. References LLViewerImage::addTextureStats(), LLSD::beginArray(), LLSD::endArray(), FALSE, LLSDSerialize::fromXML(), gDirUtilp, get_texture_list_name(), LLDir::getExpandedFilename(), getImage(), gPurgeCache, LL_PATH_PER_SL_ACCOUNT, llifstream, MIPMAP_TRUE, and S32. Definition at line 120 of file llviewerimagelist.cpp. References decodeAllImages(), f, FALSE, gPreloadImages, IMG_SHOT, IMG_SMOKE_POOF, llendl, llinfos, LLUUID::null, preloadImage(), LLViewerImage::sMissingAssetImagep, LLViewerImage::sWhiteImagep, and TRUE. Definition at line 430 of file llviewerimagelist.cpp. References llendl, llinfos, and mImageList. Definition at line 552 of file llviewerimagelist.cpp. Definition at line 489 of file llviewerimagelist.cpp. Referenced by LLFloaterScriptDebug::addScriptLine(), LLUndoWearable::applyUndoRedo(), LLEmbeddedItems::bindEmbeddedChars(), LLTexLayerSetBuffer::bindTexture(), LLVOTextBubble::createDrawable(), doPrefetchImages(), LLWorldMapView::draw(), LLTextureCtrl::draw(), LLFloaterTexturePicker::draw(), LLProgressView::draw(), LLOverlayBar::draw(), LLHoverView::draw(), LLFastTimerView::draw(), LLConsole::draw(), LLNotifyBox::drawBackground(), LLViewerJointMesh::drawShape(), LLToolDragAndDrop::dropTextureAllFaces(), LLToolDragAndDrop::dropTextureOneFace(), get_item_icon(), LLTaskCategoryBridge::getIcon(), LLFolderBridge::getIcon(), LLItemBridge::getIcon(), LLNetwork2080PageBridge::getIcon(), LLNetwork2080PlayableContentBridge::getIcon(), LLNetwork2080FolderBridge::getIcon(), getImageFromFile(), getImageFromUUID(), getUIImageByID(), LLWorldMapView::initClass(), LLViewerImage::initClass(), LLVOAvatar::invalidateComposite(), LLDrawPoolWater::LLDrawPoolWater(), LLFolderViewItem::LLFolderViewItem(), LLJoystickCameraZoom::LLJoystickCameraZoom(), LLPanelLogin::LLPanelLogin(), LLToolGun::LLToolGun(), LLViewerParcelMgr::LLViewerParcelMgr(), LLViewerPartSourceScript::LLViewerPartSourceScript(), LLVisualParamHint::LLVisualParamHint(), LLVOAvatar::LLVOAvatar(), LLVOClouds::LLVOClouds(), LLVOSky::LLVOSky(), LLPreviewTexture::loadAsset(), LLVOAvatar::onCustomizeStart(), LLPanelEditWearable::onTextureCommit(), LLPanelLandObjects::postBuild(), preloadImage(), LLWorldMap::processMapBlockReply(), LLWorldMap::processMapLayerReply(), LLVOTree::processUpdateMessage(), receiveImageHeader(), receiveImagePacket(), LLWearable::removeFromAvatar(), LLVOAvatar::removeMissingBakedTextures(), LLVOCloth::render(), LLPipeline::renderGeom(), LLPipeline::renderHighlights(), LLFace::renderSelectedUV(), LLHUDText::renderText(), LLManip::renderXYZ(), LLVOSky::restoreGL(), LLStandardBumpmap::restoreGL(), LLMapLayerResponder::result(), LLSelectMgr::selectionRevertTextures(), LLSelectMgr::selectionSetImage(), LLCompass::setBkgndTexture(), LLVLComposition::setDetailTextureID(), LLViewerObject::setTE(), LLHorizontalCompass::setTexture(), LLCompass::setTexture(), LLVOVolume::setVolume(), LLGenePool::spawn(), LLViewerObject::unpackParticleSource(), LLViewerPartSourceChat::update(), LLViewerPartSourceBeam::update(), LLViewerPartSourceSpiral::update(), updateImagesMediaStreams(), LLVOAvatar::updateMeshTextures(), updateMovieImage(), LLSelectMgr::updateSilhouettes(), LLVOGrass::updateSpecies(), LLVOVolume::updateTextures(), LLPanelRegionTextureInfo::validateTextureSizes(), and LLWearable::writeToAvatar(). Definition at line 497 of file llviewerimagelist.cpp. References getImage(), getImageFromUUID(), LLControlGroup::getString(), gNoRender, gViewerArt, IMG_DEFAULT, LLUUID::isNull(), llendl, llerrs, llwarns, LLUUID::notNull(), and TRUE. Definition at line 120 of file llviewerimagelist.h. References FALSE, getImageFromUUID(), and TRUE. Referenced by LLVOAvatar::onCustomizeEnd(), LLVOAvatar::setNewBakedTexture(), LLViewerObject::setTETextureCore(), and LLVOAvatar::updateMeshTextures(). Definition at line 559 of file llviewerimagelist.cpp. References addImage(), LLViewerImage::BOOST_UI, getImage(), hasImage(), IMG_DEFAULT, LLPointer< Type >::isNull(), LLUUID::isNull(), NULL, and TRUE. Referenced by getImage(), getImageFromFile(), getImageFromHost(), LLColorSwatchCtrl::LLColorSwatchCtrl(), and LLDrawPoolTerrain::LLDrawPoolTerrain(). Definition at line 143 of file llviewerimagelist.h. Definition at line 1174 of file llviewerimagelist.cpp. References f, LLMemoryInfo::getPhysicalMemoryClamped(), gGLManager, gSysMemory, llendl, llmax(), llmin(), llwarns, LLGLManager::mVRAM, and S32. Referenced by LLFeatureManager::applyRecommendedFeatures(), LLViewerWindow::LLViewerWindow(), LLPanelDisplay2::refreshEnabledState(), and updateMaxResidentTexMem(). Definition at line 145 of file llviewerimagelist.h. Referenced by LLGLTexMemBar::draw(), and output_statistics(). Definition at line 464 of file llviewerimagelist.cpp. References LLViewerImage::bindTexture(), LLViewerImage::BOOST_UI, getImage(), MIPMAP_FALSE, LLViewerImage::setBoostLevel(), LLImageGL::setClamp(), TRUE, and LLImageGL::unbindTexture(). Definition at line 144 of file llviewerimagelist.h. Definition at line 600 of file llviewerimagelist.cpp. Referenced by addImage(), getImageFromUUID(), and processImageNotInDatabase(). Definition at line 97 of file llviewerimagelist.cpp. References doPreloadImages(), FALSE, gNoRender, mMaxResidentTexMem, mMovieImageHasMips, mUpdateStats, mVideoMemorySetting, sNumImages, TRUE, and updateMaxResidentTexMem(). Definition at line 479 of file llviewerimagelist.cpp. References LLImageGL::dontDiscard(), getImage(), mPreloadedImages, and TRUE. Definition at line 1401 of file llviewerimagelist.cpp. References _PREHASH_ID, _PREHASH_ImageID, LLFastTimer::FTM_PROCESS_IMAGES, LLMessageSystem::getUUIDFast(), gImageList, hasImage(), LLViewerImage::setIsMissingAsset(), and t.
Definition at line 1272 of file llviewerimagelist.cpp. References _PREHASH_Codec, _PREHASH_Data, _PREHASH_ID, _PREHASH_ImageData, _PREHASH_ImageID, _PREHASH_Packets, _PREHASH_Size, codec, LLFastTimer::FTM_PROCESS_IMAGES, LLMessageSystem::getBinaryDataFast(), getImage(), LLMessageSystem::getReceiveCompressedSize(), LLMessageSystem::getReceiveSize(), LLMessageSystem::getSender(), LLMessageSystem::getSenderIP(), LLMessageSystem::getSizeFast(), LLMessageSystem::getU16Fast(), LLMessageSystem::getU32Fast(), LLMessageSystem::getU8Fast(), LLMessageSystem::getUUIDFast(), gImageList, gTextureFetch, llendl, llerrs, LLViewerImage::mLastPacketTimer, LLTextureFetch::receiveImageHeader(), LLFrameTimer::reset(), S32, sTextureBits, sTexturePackets, t, and u32_to_ip_string(). Definition at line 1335 of file llviewerimagelist.cpp. References _PREHASH_Data, _PREHASH_ID, _PREHASH_ImageData, _PREHASH_ImageID, _PREHASH_Packet, LLFastTimer::FTM_PROCESS_IMAGES, LLMessageSystem::getBinaryDataFast(), getImage(), LLMessageSystem::getReceiveCompressedSize(), LLMessageSystem::getReceiveSize(), LLMessageSystem::getSender(), LLMessageSystem::getSenderIP(), LLMessageSystem::getSizeFast(), LLMessageSystem::getU16Fast(), LLMessageSystem::getUUIDFast(), gImageList, gTextureFetch, llendl, llerrs, LLViewerImage::mLastPacketTimer, MTUBYTES, LLMemType::MTYPE_APPFMTIMAGE, LLTextureFetch::receiveImagePacket(), LLFrameTimer::reset(), S32, sTextureBits, sTexturePackets, t, and u32_to_ip_string(). Definition at line 619 of file llviewerimagelist.cpp. References FALSE, llassert, llendl, llerrs, llverify, mImageList, and LLViewerImage::mInImageList. Referenced by deleteImage(), and updateImagesDecodePriorities(). Definition at line 452 of file llviewerimagelist.cpp. Definition at line 141 of file llviewerimagelist.h. Definition at line 368 of file llviewerimagelist.cpp. References count, gDirUtilp, get_texture_list_name(), LLDir::getExpandedFilename(), LLHost::invalid, LL_PATH_PER_SL_ACCOUNT, llofstream, MAX_DISCARD_LEVEL, mCallbackList, mCreateTextureList, mImageList, mIRCallbackData, mLoadingStreamList, mPreloadedImages, mUUIDMap, S32, and LLSDSerialize::toPrettyXML(). Referenced by cleanup_app(), and LLViewerWindow::~LLViewerWindow(). Definition at line 709 of file llviewerimagelist.cpp. References LLStat::addValue(), LLPipeline::dirtyPoolObjectTextures(), f, LLFastTimer::FTM_IMAGE_MARK_DIRTY, gPipeline, llmax(), mCallbackList, mDirtyTextureList, LLImageGL::sBoundTextureMemory, sFormattedMemStat, sGLBoundMemStat, LLImageFormatted::sGlobalFormattedMemory, LLImageRaw::sGlobalRawMemory, LLImageGL::sGlobalTextureMemory, sGLTexMemStat, sNumImages, sNumImagesStat, sNumRawImagesStat, LLImageRaw::sRawImageCount, sRawMemStat, t, updateImagesCreateTextures(), updateImagesDecodePriorities(), updateImagesFetchTextures(), updateImagesMediaStreams(), and updateImagesUpdateStats(). Referenced by idle(), idle_startup(), and update_texture_fetch(). Definition at line 831 of file llviewerimagelist.cpp. 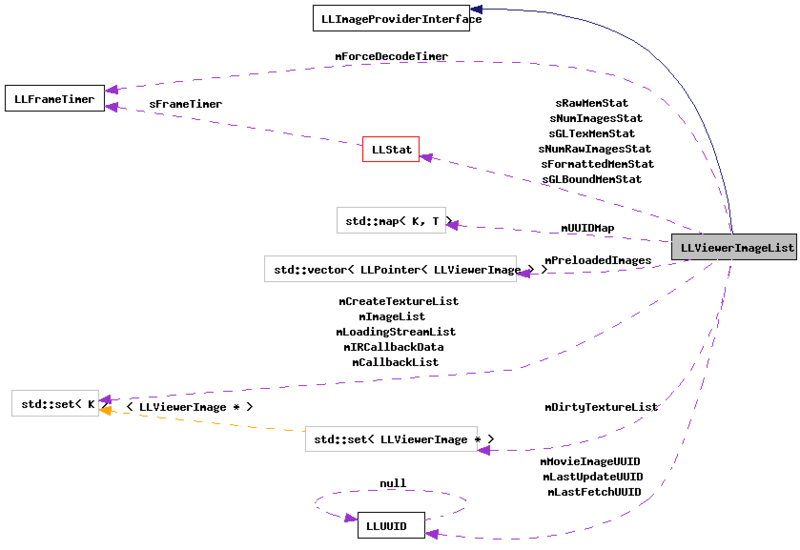 References LLViewerImage::createTexture(), LLFastTimer::FTM_IMAGE_CREATE, LLTimer::getElapsedTimeF32(), gGLManager, gNoRender, mCreateTextureList, LLGLManager::mIsDisabled, and t.
Referenced by decodeAllImages(), and updateImages(). Definition at line 747 of file llviewerimagelist.cpp. References addImageToList(), deleteImage(), f, llmin(), mLastUpdateUUID, mUUIDMap, NULL, removeImageFromList(), and S32. Definition at line 859 of file llviewerimagelist.cpp. References LLTimer::getElapsedTimeF32(), llmin(), mImageList, mLastFetchUUID, mUUIDMap, and S32. Definition at line 910 of file llviewerimagelist.cpp. References FALSE, getImage(), LLMediaEngine::getImageRaw(), LLMediaEngine::getImageUUID(), LLMediaEngine::getInstance(), LLMediaBase::getMediaHeight(), LLMediaEngine::getMediaRenderer(), LLMediaBase::getMediaWidth(), LLMediaBase::getTextureDepth(), LLMediaBase::getTextureFormatInternal(), LLMediaBase::getTextureFormatPrimary(), LLMediaBase::getTextureFormatSwapBytes(), LLMediaBase::getTextureFormatType(), LLMediaBase::getTextureHeight(), LLMediaBase::getTextureWidth(), gGLManager, gNoRender, llendl, llwarns, LLGLManager::mIsDisabled, LLImageRaw::setSubImage(), TRUE, LLMediaEngine::update(), and updateMovieImage(). Definition at line 978 of file llviewerimagelist.cpp. References FALSE, mForceResetTextureStats, mImageList, and mUpdateStats. Definition at line 1237 of file llviewerimagelist.cpp. References getMaxVideoRamSetting(), LLControlGroup::getS32(), gSavedSettings, llmax(), mMaxResidentTexMem, mVideoMemorySetting, S32, LLControlGroup::setS32(), VIDEO_CARD_FRAMEBUFFER_MEM, and VIDEO_CARD_MEM_SIZES. Referenced by LLPipeline::bindScreenToTexture(), LLVideoMemoryListener::handleEvent(), and init(). Definition at line 667 of file llviewerimagelist.cpp. References FALSE, getImage(), LLUUID::isNull(), mMovieImageHasMips, mMovieImageUUID, LLViewerImage::reinit(), LLUUID::setNull(), and TRUE. Referenced by stop_video(), and updateImagesMediaStreams(). Definition at line 69 of file llviewerimagelist.h. Definition at line 165 of file llviewerimagelist.h. Referenced by deleteImage(), LLViewerImage::doLoadedCallbacks(), LLViewerImage::setLoadedCallback(), shutdown(), and updateImages(). Definition at line 164 of file llviewerimagelist.h. Referenced by shutdown(), LLViewerImage::updateFetch(), and updateImagesCreateTextures(). Definition at line 168 of file llviewerimagelist.h. Referenced by dirtyImage(), and updateImages(). Definition at line 188 of file llviewerimagelist.h. Definition at line 170 of file llviewerimagelist.h. Referenced by display(), and updateImagesUpdateStats(). Definition at line 179 of file llviewerimagelist.h. Referenced by addImageToList(), decodeAllImages(), LLTextureView::draw(), dump(), getNumImages(), removeImageFromList(), shutdown(), updateImagesFetchTextures(), and updateImagesUpdateStats(). Definition at line 183 of file llviewerimagelist.h. Referenced by shutdown(), and ~LLViewerImageList(). Definition at line 176 of file llviewerimagelist.h. Definition at line 175 of file llviewerimagelist.h. Definition at line 163 of file llviewerimagelist.h. Definition at line 186 of file llviewerimagelist.h. Referenced by getMaxResidentTexMem(), init(), and updateMaxResidentTexMem(). Definition at line 191 of file llviewerimagelist.h. Referenced by init(), and updateMovieImage(). Definition at line 190 of file llviewerimagelist.h. Definition at line 193 of file llviewerimagelist.h. Referenced by preloadImage(), and shutdown(). Definition at line 185 of file llviewerimagelist.h. Referenced by init(), setUpdateStats(), and updateImagesUpdateStats(). Definition at line 174 of file llviewerimagelist.h. Referenced by addImage(), deleteImage(), hasImage(), shutdown(), updateImagesDecodePriorities(), and updateImagesFetchTextures(). Definition at line 187 of file llviewerimagelist.h. Referenced by getVideoMemorySetting(), init(), and updateMaxResidentTexMem(). Definition at line 204 of file llviewerimagelist.h. Referenced by init_stat_view(), and updateImages(). Definition at line 202 of file llviewerimagelist.h. Definition at line 201 of file llviewerimagelist.h. Definition at line 207 of file llviewerimagelist.h. Referenced by addImage(), deleteImage(), init(), and updateImages(). Definition at line 199 of file llviewerimagelist.h. Definition at line 200 of file llviewerimagelist.h. Definition at line 203 of file llviewerimagelist.h. Definition at line 196 of file llviewerimagelist.h. Referenced by receiveImageHeader(), receiveImagePacket(), and update_statistics(). Definition at line 197 of file llviewerimagelist.h. Definition at line 65 of file llviewerimagelist.cpp.